Three Plane Crashes: Unlikely Events – The Bookshelf of Emily J. Did you know that in the early 1950s, three planes crashed in Elizabeth, New Jersey, within a few weeks of one another? 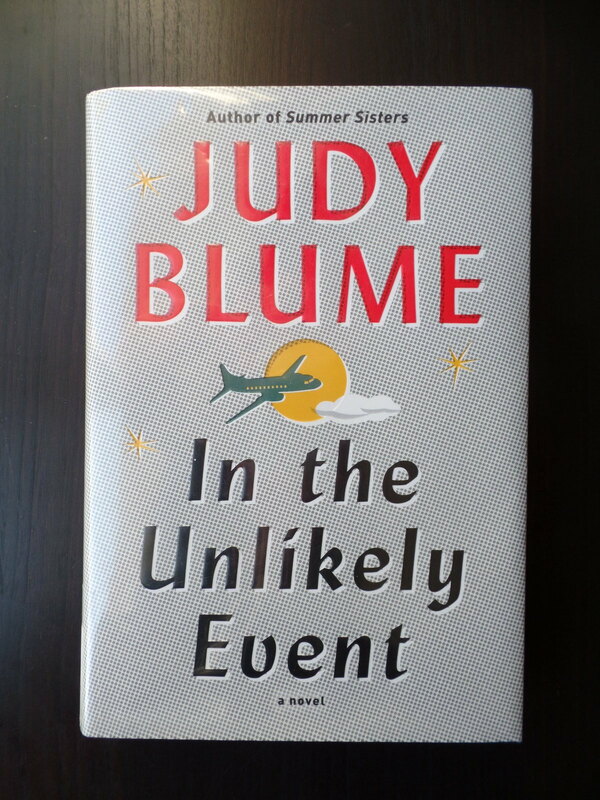 I didn’t either, until I started reading Judy Blume’s latest novel for adults In the Unlikely Event (2015). As I read about the first tragedy, I realized how hard it would be on the young protagonist, Miri Ammerman, to have witnessed it. As I read about the second plane crash, I thought, “No way!” I had assumed the novel was completely fictional, but the second crash seemed too fantastic for an author to make up. So I went to my trusty friends Google and Wikipedia. I found out that the plane crashes had really occurred, and that a third plane was still to come. Amid these tragedies, Blume traces the lives of many young people, documenting their romances, their work, their school days, their parents’ situations, and their connections with each other. It is a fascinating tale, one with almost too many characters to keep track of, but as I kept reading, I learned to keep them straight. The novel beings with Miri as an adult, returning to the site of the tragedies, which we don’t yet know about. Then it goes back in time, and we learn about Miri’s young life, her family, her friends, and others in the town. After we become acquainted with all that happened to them during this difficult time in “plane crash city,” the novel ends with Miri’s adult visit to a reunion to remember the crashes and the victims of many years ago. Once that situation occurs, the many characters make sense, as in order for Miri’s return to New Jersey and her confrontation of the past to make sense, we must also know about the pasts of the others who are present. Overall, I thought the novel was well done and skillfully connected the experiences of the many people. I do have one criticism: Blume’s writing isn’t anything to sniff at. She’s still Judy Blume, author of Are You There, God? It’s Me Margaret and Superfudge, books I loved as a kid. Her writing is accessible and entertaining, but she is no Donna Tartt. That said, I think it is okay. I still enjoyed the book. I still want to read more Blume. I still learned something from what I read. Not everybody has to be a literary master. Sometimes, the best authors tell really good stories simply. I have been trying to decide whether to try Judy Blume’s adult fiction. I read her a long, long time ago when she first started writing and was struck by her poor writing, so I never tried her again. But people keep reviewing her positively, and she has written a lot of books since then and could have developed into a better writer. But you comment negatively on her writing, so there we are. Since I never loved her as a kid (well, she wasn’t around when I was a kid), I don’t have that nostalgia pushing me to read her. Yeah, the writing is not great. The stories are fun, and she does have a clear understanding of human nature, especially from a female perspective. Still can’t make up my mind. Hmmm. I didn’t know Judy Blume still wrote books. I loved her books when I was introduced to them as a kid; I’ll have to look her up. If I remember correctly, I think this is her first book in 7 years, or it took her that long to write it. While I agree Blume is no Donna Tartt, I think Blume was exactly the right author to write this tale. It would not been half as compelling in the hands of a writer with Tart’s gift for language. “The Goldfinch” is a gorgeous and sweeping novel whose elements are large enough to contain Tartt’s prose (I raved about it in my review), but “Unlikely Event” is a much smaller story, comprised of dozens of even smaller stories to tell. It didn’t need a great writer – just a good storyteller with a gift for connecting with her reader. Donna Tart is brilliant, but sometimes brilliance just gets in the way. Good points. I think I would enjoy a Tartt version of this, but I liked the Blume version as well. It was definitely an intriguing read and I enjoyed it. I want to read this because this is about an area where my parents grew up and they remember these crashes. I’ve only read one other book by Judy Blume, Summer Sisters, which I thought was okay, but not great. Definitely entertaining, however. I think you’ve hit the nail on the head. Her adult books are entertaining for sure! I think you should definitely read this one since you have a connection to the incidents. Wow, how interesting! It makes sense that a pilot would want to be familiar with other crashes in order to avoid it or do better the next time around. Good review! I’ll be adding this to my list! I’m excited to see how Blume’s writing has developed over time. It was definitely fun to compare her children’s fiction to this! You should at least try! If you liked her as a kid, you’ll probably enjoy her adult fiction too. I don’t think I ever actually read any of Blume’s juvenile books; for some reason I just didn’t seek them out growing up. But so many people have spoken of her stories with such love, and I was considering trying her adult books now. Thank you for making the point about how great stories can still be told even if the writing isn’t masterful. That’s how I view the Little House series today — the writing is simple and direct, nothing powerful or poetic, but it’s Laura’s story itself that shines all these years later. I LOVE the little house series! I rave about it so much on this blog that people are probably sick of me. 🙂 I think the writing is appropriate for the age level, and it can reach all ages as well. You should try Blume, just for the heck of it! I will! And I hear you on Little House. I feel like I’m always writing or talking about it, too. I just started a biography, “Becoming Laura Ingalls Wilder,” and I’m trying to plan a trip to her house in Mansfield this fall! Enjoy! I think you’ll like it.